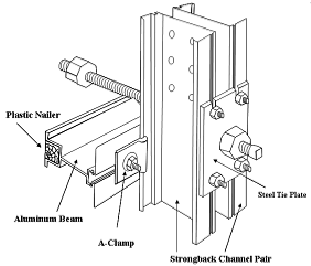 A-Clamps secure beam to beam, beam to stringer, stringer to stringer, Beam to Strongback, etc. 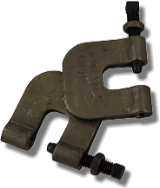 Shown in the drawing, the A-Clamp clasps 6½" A-Beam to a pair of Strongback Channels. Beam and Strongback contain T-head A-Bolt slots which allow the ease of self-locking bolts. A-Clamps come assembled with these self-locking bolts. The lip of the A-Clamp pad is specially designed to snugly fit the foot of nearly all beam used in the field (and Strongback Channels). The versatility of the A-Clamp makes it a most popular choice in shoring systems throughout the world. GATEWAY also sells the T-Head A-Bolt without the aluminum clamping pad. 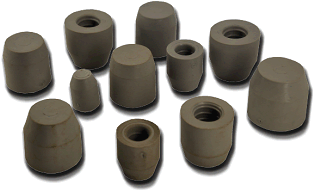 The A-Bolt comes assembled with the T-Head bolt, washer and zinc-galvanized nut (shown below). 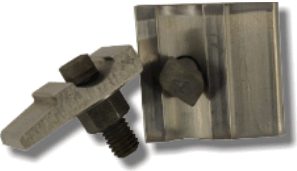 Our T-head bolts for all clamps are galvanized plated with oversized 1/2" galvanized nuts to weather years of repeated use. W-Clamps secure slotted beam to any flat surface of concrete shoring and forming members. 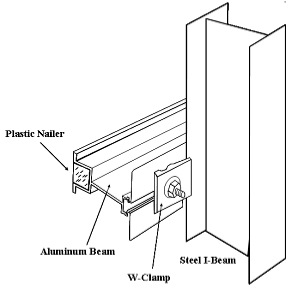 Shown here in the drawing, a W-Clamp clasps 6½" A-Beam to a steel I-beam. The W-Clamp could be used here, or to connect to a flat stringer beam base. Beam and Strongback contain T-head A-Bolt slots which allow the ease of self-locking bolts. W-Clamps come assembled with these self-locking bolts. 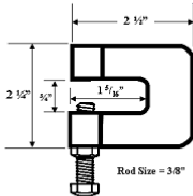 Our T-head bolts for all clamps are galvanized plated with oversized 1/2" galvanized nuts to weather years of repeated use. 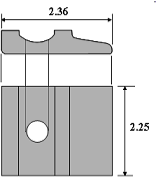 The lip of the pad is specially tapered to clamp down on any flat surface. W-Pads are also sold separately for joining steel or aluminum to wood via a lag bolt. The versatility of the W-Clamp makes it a most popular choice in shoring systems throughout the world. C-Clamps are particularly versatile on the job site. They are used to clamp any flat surfaces together for stability and rigidity. C-Clamps can be used to fasten together beams, beams to shoring heads, etc. 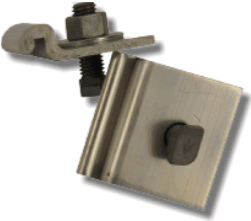 We offer two styles of C-Clamps: plated with zinc galvanize, or unplated. The plated version is by far the more popular as it will withstand years of outdoor use. The unplated style is less expensive but limited to applications where it will be protected from the weather. Sure Plugs are used when tapered ties are removed from concrete that is expected to be made water tight. Sure Plugs are made of an elastic rubber alloy that allows the plug to distort and elongate as it is forced into the tapered hole left by the tie. 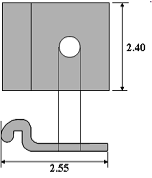 With the proper insertion tool, the plug can be set either flush with the face of the concrete, or recessed a pre-defined depth. 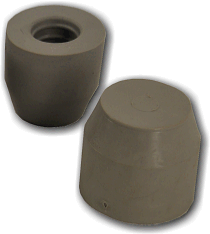 The plugs have a concrete gray color that allows them to be flush mounted such that they are not obvious. 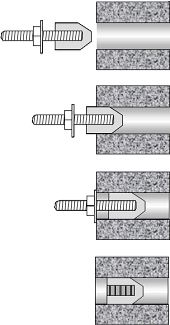 These drawings show the plug recessed into the concrete. Once recessed, the plug can be grouted over to create a smooth concrete face. The inside of the plug is ribbed to provide a positive grip for a grout application. Plugs come in the more popular sizes: 1", 1-1/4" and 1-1/2". A plug insertion tool is also available. Most sizes are in stock for immediate shipment.